Why Should I get the New TapRooT® Books? When someone calls me for help with an investigation, I often ask them what color TapRooT® Book they have. Sometimes they want to know..
What difference does it make what color my book is? The answer is that it let’s me know how long ago they took TapRooT® Training and what version of the TapRooT® System they are using. It is always sad to see people struggling with an issue we solved by improving TapRoot® and they just don’t know about the improvement. Over the almost three decades that we have been developing TapRooT®, we have made major improvements. If you are still using the system that came in three-ring binders, you are back in the 1996 version of the system. You might think that NOBODY would be using that outdated a version of the system but someone sent me a review of TapRooT® that they read and … sure enough … the review was of the 1996 book. So to people still using the three-ring binders: Update your documentation to the newest version and you will be shocked. If you have the green book, you are working from the 2000 revision. You are working from a system from the same millennia. Update to the new version and you will jump ahead 16 years. If you have the thick black book, you are working from the 2008 version. You too will be pleasantly surprised by what we have learned in the last eight years and how we have improved the usefulness of the TapRooT® Books. And what is the latest version? These books are also black but there are smaller and there are eight of them (currently book five and eight are still in production). What do these books look like and how are they an improvement over the older 2008 book? 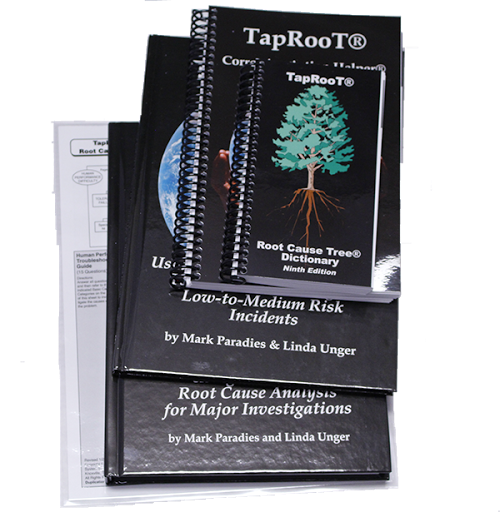 These are the books that cover using TapRooT® to find the root causes of everything from small/minor incidents to major accidents. How are they an improvement over the older 2008 TapRooT® Book? Well … we took everything we have learned in the last eight years and used it to improve our documentation. And the first things we learned is … LESS IS MORE. That’s why we broke the books up into separate topics. You can just read what is applicable to what you are doing. But how specifically is the investigation set improved over the old book? The set includes the latest Root Cause Tree® and Dictionary that make the system even better with improved definitions in the Dictionary and an new category (language) in the Communication Basic Cause Category. The Essentials Book is a an easy read (only 100 pages long). It guides you through a new 5 step process that makes TapRooT® easy to use for simple investigations. This improves your simple investigations while saving time. The Major Investigations Book explains the whole TapRooT® System and includes the traditional 7-Step Investigation Process. The book includes improved TapRooT® Techniques, detailed examples of each technique, and even better ideas to help you identify your Causal Factors before you start analyzing their root causes. The set also references the latest TapRooT® Software (Version VI). The ideas we have for improving low-to-medium risk investigations alone are worth buying the new set. Book 3: Using the Essential TapRooT® Techniques to Investigate Low-to-Medium Risk Incidents, is included in the 2-Day TapRooT® Root Cause Analysis Training. The 5-Day TapRooT® Advanced Root Cause Analysis Team Leader Training include Book 4: Using TapRooT® Root Cause Analysis for Major Investigations, and Book 3. Until Book 1: TapRooT® Root Cause Analysis Leadership Lessons was written, we really didn’t have a book that explained the concepts of TapRooT® Root Cause Analysis to management. Now we have produced a concept book that is just 70 pages long (think of it as a bedtime story for management). When management asks what they need to know about TapRooT®, Book 1 is the place to start. Of course, we would like leaders to learn much more about a tool that should be in their leadership tool kit but Book 1 is a starting point to get management to understand the basis for TapRooT® and how it will help them improve safety, quality, productivity, and environmental compliance. To learn more about this book, CLICK HERE, or order your copy at: http://www.taproot.com/store/TapRooT-R-Philosophy.html. Book 2: TapRooT® Root Cause Analysis Implementation, is for those in charge of an improvement program. It explains how TapRooT® can be used to improve an already existing program or part of a completely new improvement effort. Making this a separate book (89 pages long) helps the right people get the right information to make their improvement program much more effective. The “Just Do It!” method of getting started. How to add TapRooT® Root Cause analysis to an existing 6 Sigma, Lean, 8-D, Process Safety, Behavior-Based Safety, or other improvement initiative. Building a best-in-class improvement initiative. A checklist to evaluate your improvement efforts. If you are serious about improvement and in charge of a program to make improvement happen … this book is for you. Order it HERE. This book is close enough to finished that I can explain what you will find in it when it comes out. If you are interested in equipment troubleshooting and root cause analysis, this is the book for you. Book 5: Using Equifactor® Troubleshooting Tools and TapRooT® Root Cause Analysis to Improve Equipment Reliability, explains how to use TapRooT® and Equifactor® to solve equipment problems. The new book explains the techniques and includes a paper version of the equipment troubleshooting tables from the TapRooT® VI Software all in one book. That makes this a much handier reference. We expect this book to be available in the 1st half of 2018. Watch our newsletter for more information. 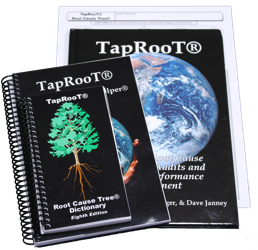 Book 6: TapRooT® Root Cause Analysis for Audits and Proactive Performance Improvement, explains how to build TapRooT® root cause analysis into your audits and proactive improvement efforts. It’s only 57 pages long and is a great compliment to books 3 and 4. It describes the 7-step process for using TapRoot® in an audit and how to build TapRooT® techniques into your proactive improvement efforts. What’ new about book 6? It is the latest information about using TapRooT® to audit performance. It can be used for safety or quality audits. It’s a very fast read. This book is included in the course materials for the pre-Summit TapRooT® for Audits Course. 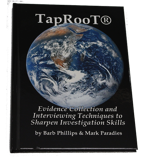 Book 7: TapRooT® Evidence Collection and Interviewing Techniques to Sharpen Investigation Skills, is all about information collection. We’ve never had a book specifically about this topic. In the past you had to find some of the information provided here buried in the steps of the old 2008 TapRooT® Book. That’s a lot to pack into a 93 page book! Buy this book by CLICKING HERE. This book is also still in production but is also expected in the first half of 2018. Book 8: TapRooT® Performance Measures and Trending for Safety, Quality, and Business Management, explains the state-of-the-art in performance measurement and trending. If you have ever wondered how you can prove that you have improved or if a “negative” trend is actually significant, this is the book for you. In addition, the book explains what management should know about trends. This information can keep them from being misled by false trends and how to use trends to manage improvement initiative. The math involved isn’t complicated, but it is beyond some of the common “trending” graphs that you may be using now. This book is included in the pre-Summit Advanced Trending Techniques Course. Watch our newsletter for more information on when the book will be available. KEEP UP TO DATE! If you don’t have the latest TapRooT® Books that apply to your work, order them today!